Senior forward Danielle Garven (1) drives the ball during Pitt’s 65-62 victory over Fordham. 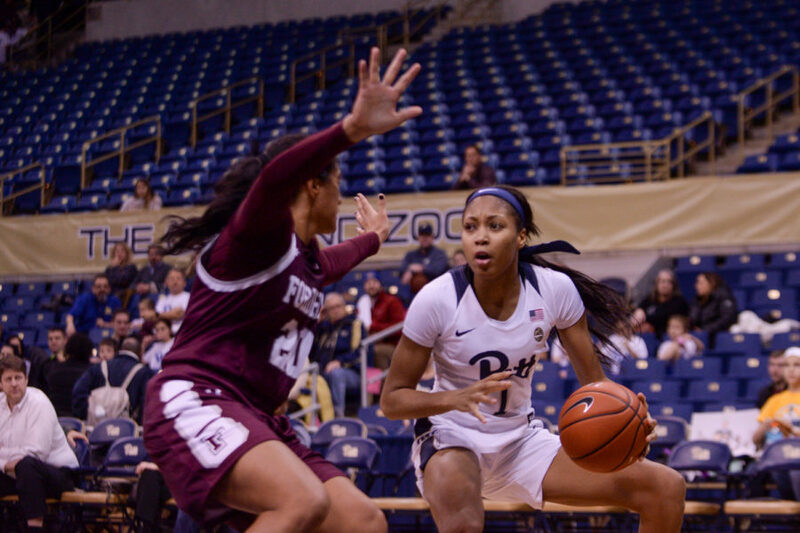 In a game that went back and forth throughout, the Pitt women’s basketball team narrowly persevered against Fordham, defeating the Rams 65-62 at the Petersen Events Center Wednesday night. The Panthers (6-4) got revenge against the Rams (5-5), who beat them 58-55 in a close game in the Bronx last year, earning their fourth straight victory. After the game, head coach Lance White showed his pride for his team’s effort and ability to keep proving themselves in close games. Pitt started out the game scoring well, leading 12-9 by the first media timeout. Senior guard Cassidy Walsh hit a 3-pointer and sophomore guard Jasmine Whitney made two foul shots and a jumper to help get Pitt into the lead. Fordham soon took control of the quarter after the break and led by the end. First-year forward Megan Jonassen made three straight buckets for the Rams to earn their first lead, 13-12, at the 2:53 mark. After a jumper from Pitt first-year guard Ismini Prapa, Fordham went on a 6-0 run to end the quarter, still up 19-14. The second quarter resembled the first, with both teams lighting it up on the offensive end. Senior forward Danielle Garven led the way for the Panthers, scoring six of their first nine points in the quarter to bring her total to eight. Fordham countered with crucial 3-pointers from sophomore guard Breanna Cavanaugh and senior guard Lauren Holden to stay ahead. Pitt senior forward Kauai Bradley also displayed her long-range abilities, knocking down two 3-pointers in the quarter. Bradley, who is usually known for her defensive prowess and not her shooting, made three 3-pointers in the game. She said she has been pushed by her teammates and coaches to take more shots during games. “Coach always tells me to keep shooting it because the next one is going to go, and then my teammates always encourage me to shoot, so it was just all ball today,” Bradley said. Sophomore guard Kendell Heremaia led the Rams, hitting a 3-pointer and making two layups, giving her seven points in the quarter. Both Whitney and sophomore center Cara Judkins hit layups to cut into the lead, but a 3-pointer by senior forward Mary Goulding gave Fordham a 39-34 lead going into the half. In the third quarter, layups by Whitney and Bradley got the Panthers within one, but Fordham got the lead back up to nine with 3-pointers from Cavanaugh and Goulding and a jumper from Jonassen. This led White to call a timeout with 7:21 left in the third. The scoring slowed down mightily in the third, with both teams failing to convert shots and making easily avoidable mistakes leading to turnovers. Sophomore guard Kyla Nelson hit a 3-pointer with 6:47 remaining, but the next basket for either team didn’t come until three minutes later when Garven converted from mid-range. Bradley continued to make 3-pointers, hitting one to tie the game at 47 with 1:53 left in the third. A hook shot by Judkins gave the Panthers the lead for the first time since the first quarter. Those three 3-pointers were the only shots made in the quarter for the Rams, as they went 3-16 from the field and 2-8 from the 3-point line. Cavanaugh finally broke the scoreless streak for the Rams, making a layup to tie the game and bringing her points total to 12. Whitney responded with a mid-range jumper to continue her stellar play and put the Panthers on top. But the Rams came back again to take the lead, with Cavanaugh making two 3-pointers and Jonassen scoring to make it 60-59. Garven also made a basket to give her 16 points on the night. Judkins made an easy bucket down low to put Pitt back on top, 61-60. After a Fordham timeout, the Rams failed to score and Whitney made them pay, driving on Cavanaugh and making a layup to put the Panthers up three with 26.6 seconds remaining. Because of redshirt senior guard Aysia Bugg’s absence, Whitney has taken over as court leader. Whitney said even if Bugg isn’t on the court, she still aids her in games. Heremaia made a layup with seven seconds left on the next possession to bring Fordham within one. With Pitt inbounding, the Rams tried to trap instead of foul and allowed the clock to go down to 1.2 seconds. Then sophomore guard Zara Jillings intentionally fouled Garven, committing a technical foul. Whitney made both free throws and Pitt got the ball out for one last inbound to end the game victorious, 65-62. The Panthers will look to add to their winning streak Saturday when they take on a bitter rival, West Virginia, in the Backyard Brawl at the Petersen Events Center at 3 p.m. Does Pitt have a case for Running Back U?